From the Registration types & settings tab, you can control various event settings and set up event registration types for advanced events. Registration settings apply to the entire event. The following event registration settings are available. 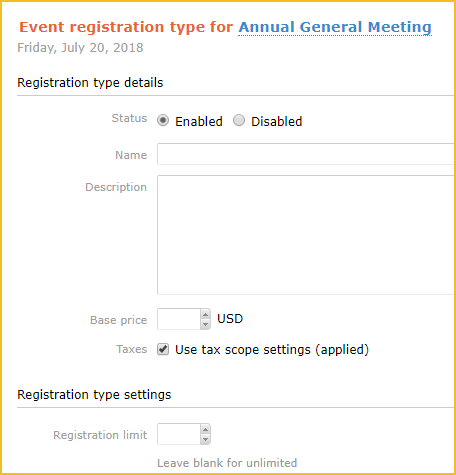 Allows you to set a limit on the total number of registrations for the event. You can also set registration limits for individual registration types. After the event registration limit is reached, the registration will be closed and an email will be sent to the event organizer. On your event calendar page, visitors will see that the event is closed for registration, and that there are no spaces left. For more information, see Capping event registrations. 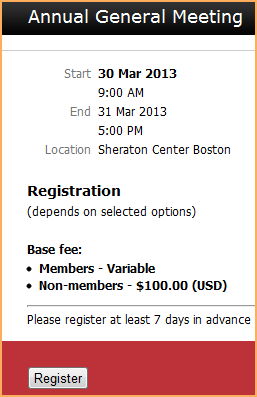 Controls whether prospective registrants can join a waitlist after the registration limit is reached for the event. (This option is only available after you've set a registration limit.) After enabling this option, you can click the Waitlist & settings tab and choose how much information to collect from people wanting to join the waitlist. 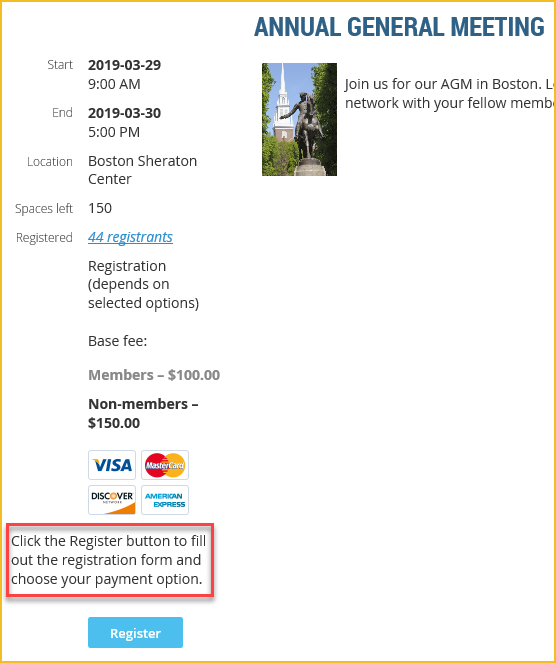 When the waitlist is enabled, a Join waitlist button appears within the event details on your public site when the registration limit is reached. For more information, see Event waitlists. Controls whether visitors can register multiple times for the same event. You can enable multiple registrations for the entire event or for individual registration types. With this option unchecked – so that multiple registrations are disabled – an attempt by a registrant to register a second time will generate an error. Whether the option is enabled or not, an administrator can still set up multiple registrations for a contact, but will be warned about the existing registration. If multiple registrations are disabled at the event level, this option will not be available for individual registration types. Allows you to choose whether to accept online and/or offline payments for the event. The online option is only available if online payments have been enabled for your site. Depending on which payment method option you choose, different payment workflows will take place. If only offline payment is enabled, then an invoice will be emailed to the contact after they click the Confirm button – unless invoice emails have been disabled from the Invoice and receipt settings – and a registration summary will be displayed. From the registration summary, the contact can choose to view or pay the outstanding invoice. If only online payment is enabled, then a Pay online button will appear. Clicking the Pay online button will take the contact to the online payment screen for your site's payment provider, where they can pay the registration fee. The fee will not be adjusted to take into consideration any credits or other outstanding invoices. With the Online only payment method selected, you can choose to automatically cancel the registration if the registration fee is not paid within 15 minutes. With the Automatically cancel registration if payment not received within 15 minutes option enabled, the unpaid registration will be automatically canceled, the corresponding invoice will be voided, and the registration cancellation email will be sent. If not already a contact in your database, the registrant will be added as an archived contact. Payments made after 15 minutes will be recorded but will not be applied to the invoice. If both online and offline payment is enabled, then two buttons will be displayed: Pay online and Invoice me. Clicking the Pay online button will take the contact to the online payment screen for your payment provider. Clicking the Invoice me button will result in the contact being emailed an invoice – which they can pay online or offline – and a registration summary being displayed. From the registration summary, the contact can choose to view or pay (online) the outstanding invoice. When paying using PayPal Payments Pro, the Pay online button with be replaced with two buttons: Pay with credit card, and PayPal Express checkout. The message you enter here appears between the payment option icons and the Register button on the public details page for the event. You might want to enter instructions to registrants about the registration process. and at the bottom of the invoice email sent to the registrant. The payment instructions for each event default to the For event registrations payment instructions that were entered on the Payment settings screen. For advanced each event, you can set up different registration types. Registration types are like ticket types for a particular event. Setting up registration types allows you to charge different prices for different event packages or for different kinds of attendees. For example, you might want to charge more for non-members, or for special seating. You can cap the number of registrations for each registration type – separately from any overall event registration limits. 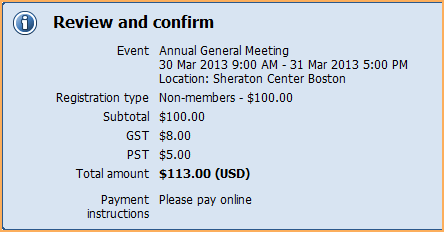 For example, you might want to offer a limited number of lower cost student registrations. You can also define a registration window – starting and end dates – to allow for limited time discounts. As well, you can control whether contacts can register multiple times for the same event. You have to set up registration types before you can enable an event for registration. Creating an event by copying an existing one will copy the registration types as well. For simple events, a single registration type called RSVP is automatically created. Select the event within the list. Click Registration types & settings tab. If you created the event from scratch, you will be prompted to create a registration type. If the Add type button is grayed out, it's because you are currently editing other event details. You cannot add registration types while in edit mode. You have to click the Save button to save your changes or click the Cancel button to discard them. To add a registration type, click the Add type button from the Registration types & settings screen. If this button is grayed out, you need to exit edit mode by clicking the Save or Cancel button. Controls whether the registration type is active. Name used to identify the registration type (e.g. Non-member or VIP seating). This will be displayed to the registrant when asked to choose the registration type. Registration types are displayed in alphabetical order on the event registration form, so if you want to re-order them, you have to rename them or add numbers ahead of the names. If you have 10 or more events, the numbering should begin with 01 for proper alphabetical sorting. Similarly, if you have 100 or more events, the numbering should begin with 001. Description of the registration type. Base price for this registration type. This does not include any additional event options available for a separate cost. Choose whether to follow the tax scope settings, or ignore the tax scope and apply or disable tax for this registration type. See Setting up and applying taxes for more information. The maximum number of registrations allowed for this registration type. Leave this field blank if you don't want to set any limit. An overall registration can also be set for the event itself. Controls whether prospective registrants can join a waitlist after the registration limit is reached for this type. (This option is only available after you've set a registration limit.) After enabling this option, you can click the Waitlist & settings tab and choose how much information to collect from people wanting to join the waitlist. When the waitlist is enabled, a Join waitlist button appears within the event details on your public site when the registration limit is reached. For more information, see Event waitlists. Controls whether contacts can register multiple times for the same event. If multiple registrations are disabled at the event level, this option will not be available for individual registration types. Controls whether registrants using this registration type can cancel their event registrations from their member profile. If you enable the Allow cancellation option, you can specify the minimum number of days before the event that cancellations can take place. For example, if you don't want cancellations in the week leading up to the event, you would specify 7 days. If the number of days is not specified or set to zero, then cancellations will be allowed right up to the beginning of the event. If enabled, registrants can register guests at the same time that they submit their own registration. You can control whether to collect contact information for each guest, collect full registration information for each guest, or just ask for the total number of guests. Unless you choose to collect full registration information for each guest, you can charge a special guest price for the event. 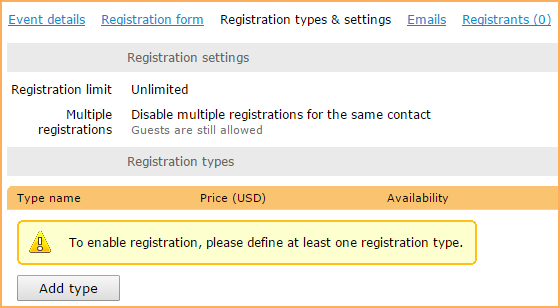 You can also specify a limit on the number of guests each registrant can bring. Controls whether this registration type is available to everyone, just certain membership levels, or to anyone with the registration code you specify. Using registration codes allows you to offer discount pricing to selected people. Member-only registration types are not available to new members if their membership requires administrator approval, or if their membership requires payment before activation and payment has not yet been made. Controls when this registration type is available. You can set a From date, a Through date, or both. Leave both fields blank if you don't want to set a date limit. Registration will remain open from 12:00 am on the From date, until 12:00 pm on the Through date. ...or hide the registration type entirely. Once you have finished setting up a registration type, click Save. Go to the Registration types & settings tab. Click the registration type you want to modify. If you can't select a registration type for editing, it's because you are currently editing other event details. You cannot modify registration types while in edit mode. You have to click the Save button to save your changes or click the Cancel button to discard them. Click the registration type you want to duplicate. Click the Duplicate button. The new duplicate registration type is automatically loaded. The word (copy) will be added to the name of the new registration type to distinguish it from the original one. Click the Edit button and make the necessary changes to the new registration type. Before you can delete a registration type, you must remove everyone using the registration type from the registrants list and the waitlist. Click the registration type you want to delete. Click OK when prompted to confirm the deletion. 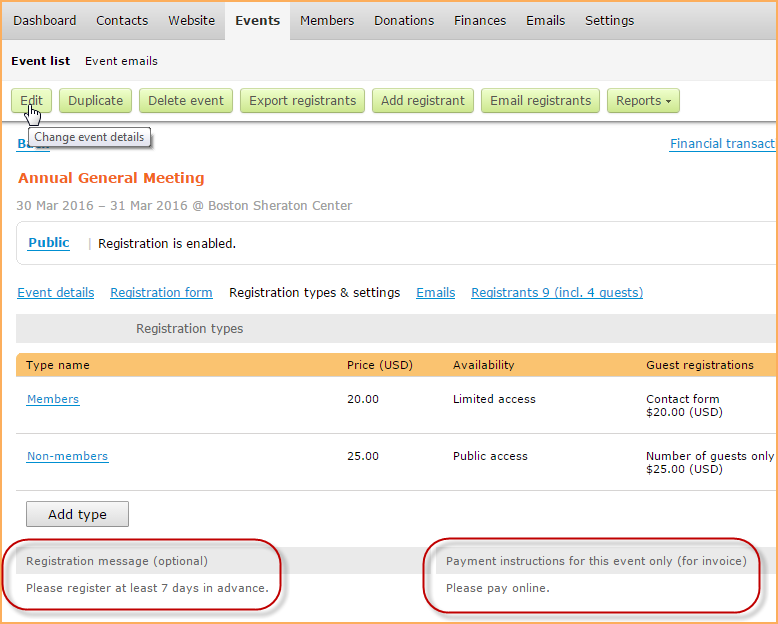 For each event, you can provide a registration message and payment instructions. On the Registration types & settings tab, click the Edit button to enter edit mode. The instructions you enter here will override the default event payment instructions entered in your payment settings. Registration types are displayed in alphabetical order on the event registration form, so if you want to re-order them, you have to rename them or add numbers ahead of the names. If you have 10 or more events, the numbering should begin with 01 for proper alphabetical sorting. Similarly, if you have 100 or more events, the numbering should begin with 001.